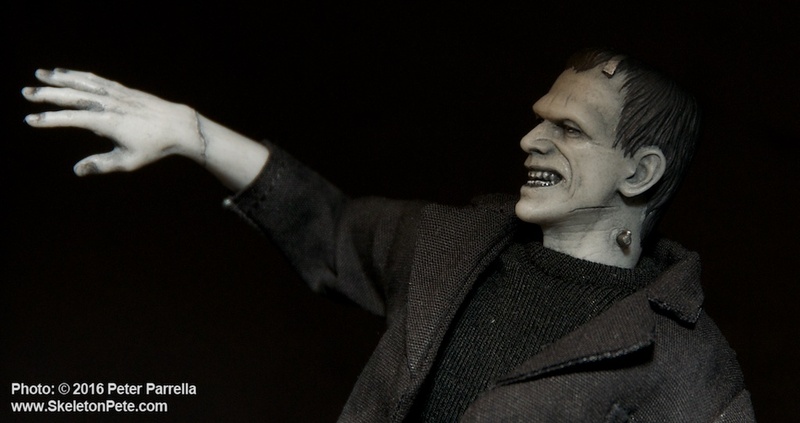 It’s thrilling to see the sculpt faithfully capturing Boris Karloff’s visage as the gaunt, dead-eyed, thing. 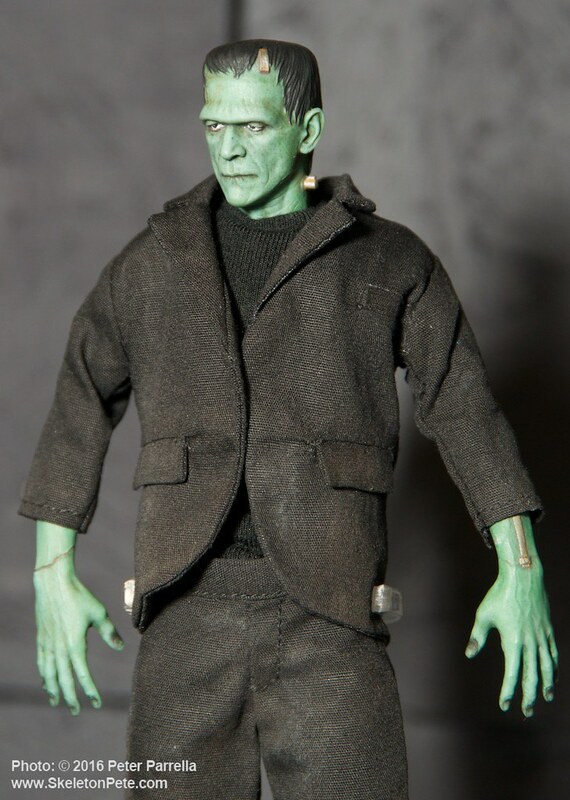 So many of Universal’s past Frankenstein monster licenses have only allowed a generic – placid and flaccid – countenance. Not so here. 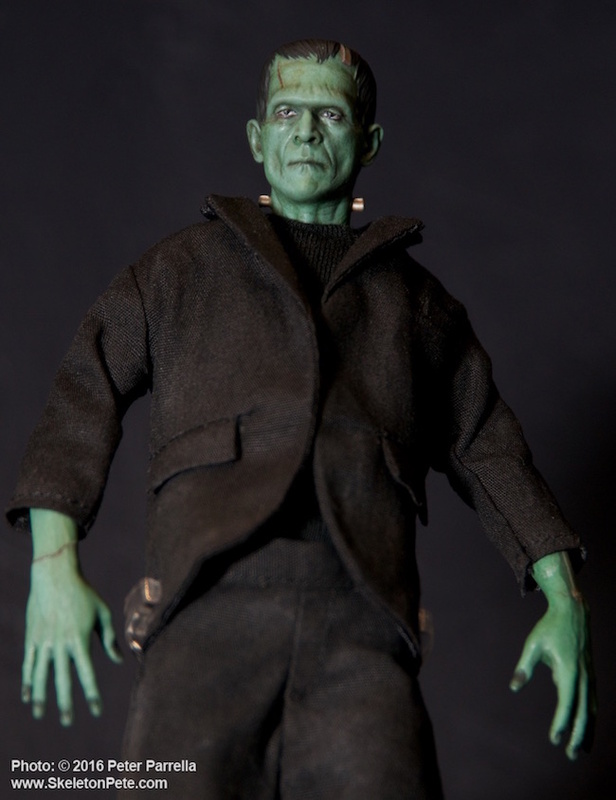 In fact Mezco’s monster is the most exciting depiction in my recollection. 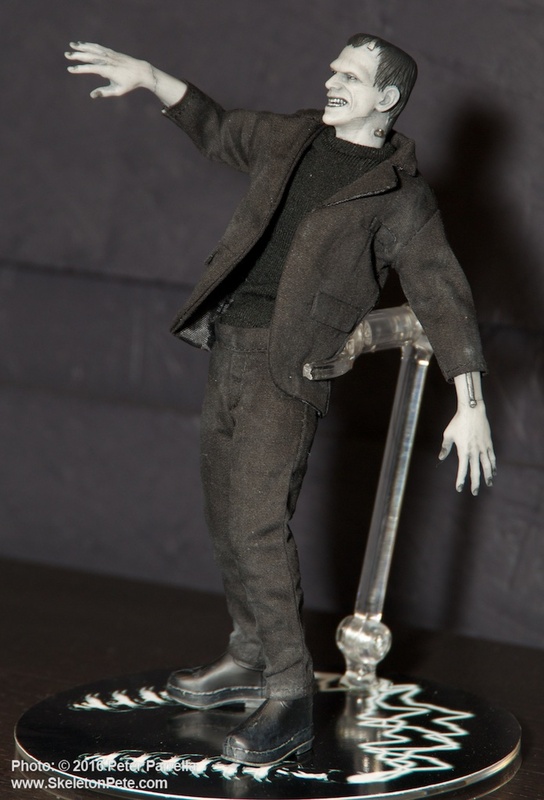 Though I was taken with the displayed prototype at New York Comic Convention last year, I was simply bowled over to see its secondary head at Mezco’s Toy Fair prevue last February. The figure’s grimacing replacement head recalls scenes where the monster is being taunted by Fritz (Dwight Frye,) the doctor’s demented servant, or futilely flailing at the flames during it’s ultimate demise in the burning windmill. This is the kind of thing collectors yearn for but rarely get. 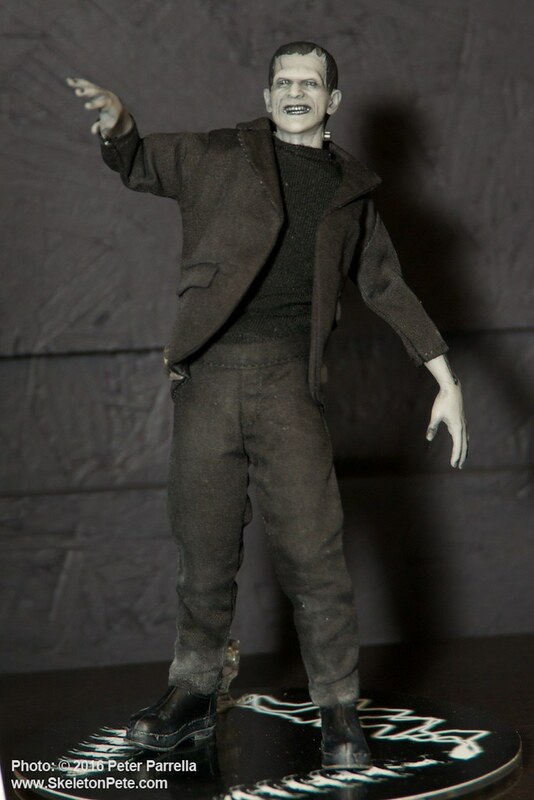 This week it was announced that Previews will exclusively offer the color version of the Frankenstein Monster. 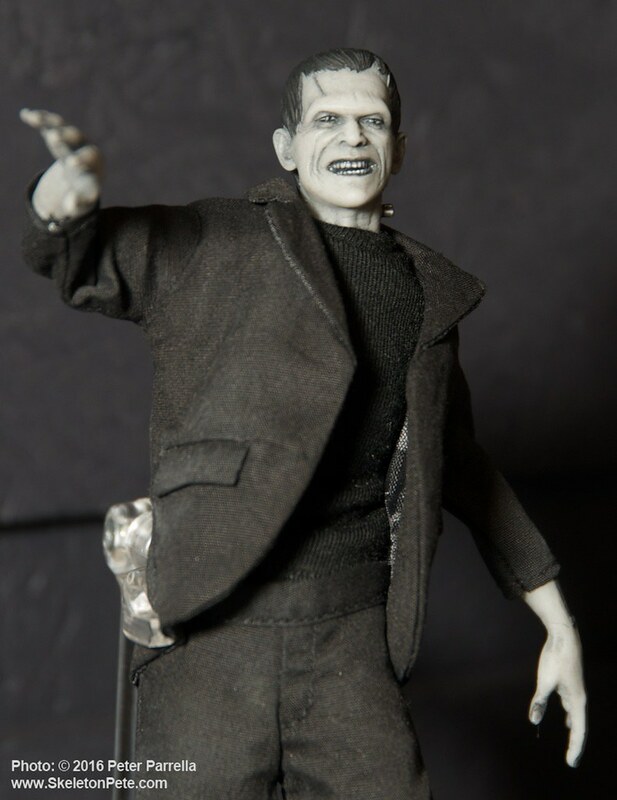 Previews has the exclusive on this color rendition of Karloff’s Frankenstein Monster from Mezco Toyz’ One:12 Collective. As explained in previous SkeletonPete features, Mezco’s One:12 Collective figures are based on a limited series of articulated body types. Each is beautifully outfitted in cloth with a selection of heads and hands, appropriate accessories and a stand. The standardization of the bodies has allowed the company to quickly forge a wide selection of characters from Marvel and DC superheroes through Star Trek actors, while retaining a high attention to detail. The modular nature of the series makes it reasonable to assume some left-of-center offerings might lurk down the road. A Colin Clive Doctor F? Ernest Thesiger as Dr. Praetorius? A Larry Talbot head for The Wolfman? Not inconceivable. Along with an additional flotilla of figures announced at last months San Diego Comic Con, Mezco has revealed its first One:12 female – Harley Quinn. How far behind can a bride for the lonely Monster be? While the approximately 6” figures themselves are a joy to pose and handle, the extras packed with them are a special treat. For instance, the Star Trek crew comes with a selection of miniature phasers and tricorders and Captain Kirk will have an optional captain’s bridge chair. Mr. Spock has a “live long and prosper” alternative hand and a raised eyebrow replacement head, while the Dark Knight Batman has an arsenal of guns and gadgets. My favorite so far will be packaged with the One:12 Superman. What more could a 60’s DC Comics fan ask for but the miniaturized and bottled Kryptonian City of Kandor? That’s so cool. I’ll be posting a gallery of my One:12 Collective images later this week. That will include some close-up looks at Captain America, The Punisher, Daredevil, Mr. Spock, Captain Kirk and Mr. Sulu, an awesome Green Arrow, Space Ghost, and more. 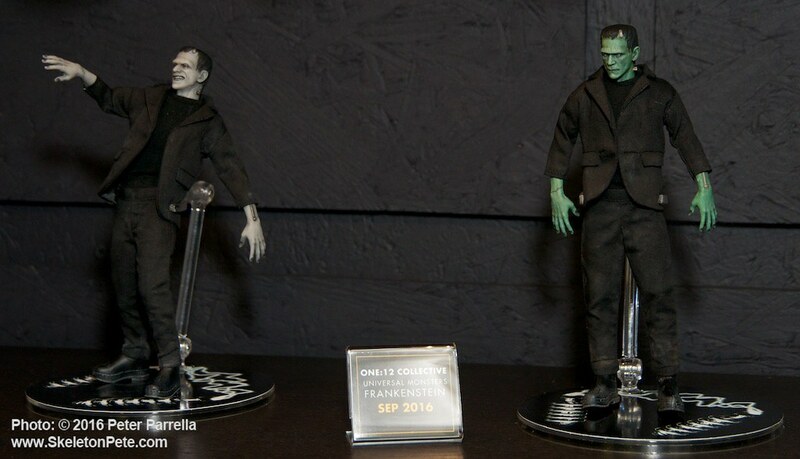 These are exceptional for sure and I just cannot wait to see what the rest of the Universal Monsters will look like. These horrific creatures are the stuff of legend and I feel that with these Mezco Toyz items that they will continue to terrify the masses. Sleep with one eye open my friends.